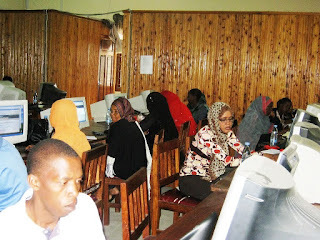 Here are some pictures from the internet training at SUZA computer room, Stone Town, Zanzibar. 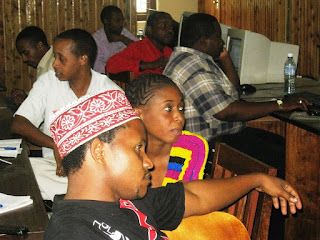 In the flashlight on the left, Ali Mohammed from the Maelezo Zanzibar, the government information services. Behind Hasina Hamad Shehe, Radio Zanzibar, Salha Mohammed Ali, TVZ, Mozza Saleh Alli, Zenj FM and Asya Sharif Omar, Radio Zanzibar, Pemba. Here are from the front Ali Mbarouk, Pemba journalist and information officer, Zaituni Makwali, Chuchu FM, Ramadhan Suleiman, Zanzibar Leo, Juma Mbarouk Mohammed, TVZ, Mohammed Othman, Zanzibar Leo, Hassan Issa Ali, Business Times, and Abdallah Mitawi, TVZ. Many thanks to Maggid Mjengwa for the pictures.